If you know me, you know I’m very into social justice - especially organizations and movements that empower women all over the world. When the brand PURPOSE Jewelry reached out to me to partner on some posts featuring their pieces, I knew I had to share their brand with you. PURPOSE Jewelry is a brand that works with victims of human trafficking to empower them and give them employable skills to help improve their quality of life after being rescued. When you make a purchase from PURPOSE Jewelry, proceeds go to International Sanctuary, a charity that works for the empowerment of human trafficking victims. Keep reading to see what I think about their jewelry and to learn more about their mission (there's also a discount code at the end if you're interested in the collection)! I was very kindly gifted the Tuscany necklace and the Signature bracelet from PURPOSE Jewelry. Both are really beautiful and quite well made and are of two very different jewelry styles. Besides the craftsmanship and overall mission of the brand, my favorite part about the pieces is that the tag that comes with each of the items shows the name of the person who created the piece. Giving an identity to the women whose identities were threatened by human trafficking is so powerful and a really amazing detail to include with the packages. The Tuscany necklace came in a paper envelope that said "love with purpose" while the Signature bracelet came in a paper box that says "wear freedom." The Tuscany necklace is a long necklace that you can wear with its full length or you can layer it about once or twice around your neck - I’ve even wrapped it around a couple more times to wear it as a bracelet. The beading work is beautiful and definitely looks like you could have a one of a kind piece depending on the beading pattern. While I don’t wear beaded jewelry too much, the traditional style of the necklace is definitely something that is trending at the moment and will work well in my fall to winter wardrobes (and probably in my spring and summer looks as well). The dark blue beads and gold accents are a subtle color palette to accessorize with - it isn't too loud or overstated but will still gleam and add an extra bit of sparkle to your look. I love the versatility of the piece and at $34, it's very well priced for a handcrafted jewelry piece. The Signature bracelet is something more my style since I wear a couple delicate pieces of jewelry every day. This beautiful piece of metalwork is a little piece of luxury that can be worn daily like I've started doing or saved for special occasions. The symbol at the center is PURPOSE's icon and represents freedom. 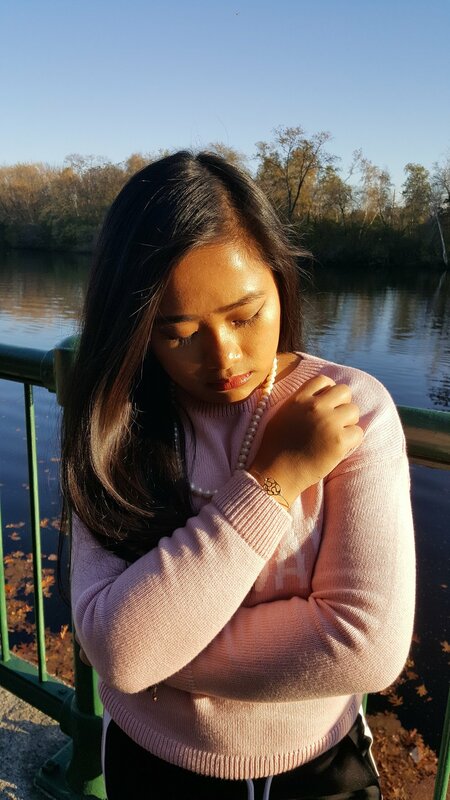 This piece shows that wearing your support for a cause like this doesn't have to be unstylish like a ribbon or a rubber bracelet - the thin 14K gold plated bracelet is an understated yet powerful piece you can add to any look. I wore it around yesterday during a casual Sunday in a sweater, track pants, and loafers - paired with my new pearl necklace that Gerome got me from the Philippines, the PURPOSE jewelry pieces added a bit of glam to my Sunday look. This piece is only $54 and a perfect gift to give for the holidays (you might spot it in one of my holiday gift guides coming up)! There are also earrings and rings with the freedom symbol. I was sent this video to watch about the brand and I thought it was a really powerful video and worth the watch. Human trafficking is such a big issue in the world and affects women so much - it may seem difficult to stop it on your own but supporting organizations that do work to stop it or empower its victims is one way to do it. Proceeds from PURPOSE go to International Sanctuary, which helps victims of human trafficking by inviting victims to their iSanctuaries around the world where they then give them emotional support, give them employable skills like jewelry crafting and office work, help them build savings, give them access to medical care, and provide them with an education. Their 2020 goal is to have 10 sanctuaries around the world; currently they have sanctuaries in Orange County, USA, Kampala, Uganda, Tijuana, Mexico, and Mumbai, India. If you want to learn more about the charity, you can visit isanctuary.org and purposejewelry.org. If you want your own PURPOSE Jewelry piece to give as a gift this holiday season or just to support their mission and add to your jewelry collection, you can receive 15% off your purchase until 12/15/2017 with the code YNA. I hope you enjoyed this post and if you do decide to get a piece from PURPOSE or have any questions about the brand, please let me know in the comments! If you want to stay updated on my blog posts or my gift guides, please follow me on Bloglovin' and join me on social. I'm on Instagram, Facebook, Twitter, and Pinterest! Please share this post with anyone who may be interested in PURPOSE (you can use the buttons below)👇🏽 Thanks for stopping by the blog!